Ever wonder what it would feel like to walk on water? Ever wonder what it would be like to be trapped in a hamster ball? Odd questions right? Seemingly unrelated eh? Not now! You can buy a 6-Foot Walk-on-Water Ball. This 6ft inflatable ball lets you walk across water as you walk/crawl inside. Each coloured dot is a cup that allows the ball to ‘grip’ the water and propel you one direction or another. A speed valve allows the ball to be inflated in 5 minutes. Fully inflated the ball weighs approximately 50lbs. There are two holes for entrance and exit and includes a rope for securing the ball to a dock. 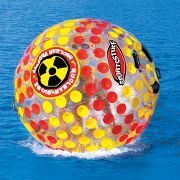 The walk on water ball is intended for ages 10 and up and will support weight up to 170lbs.